OH! 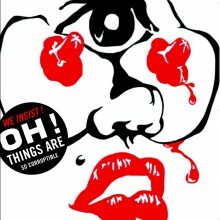 Things Are So Corruptible (2007) - We Insist! We Insist! "OH! Things Are So Corruptible" was recorded by Peter Deimel (The Kills, Chokebore, The Thugs) at Blackbox Studios, mixed by d2r2.off (Eon MegaHerts, Ltno) and mastered by Jean-Pierre Chalbos at La Source. In order to go beyond the thickness of Crude, We Insist! had to instil exuberance and warmth into their music. And that is exactly what they have achieved with their new release. Each of the 12 tracks had been in existence for more than two years previous, gaining more power, subtlety, cohesion and energy with each live performance. "Corruptible" was first released on We Insist! 's own label "Corruptible Records" which was distributed in France by Anticraft. We Insist! also received great support and promotion from both the independent radio station community Ferarock, as well as Versus Magazine. A period of touring within France ensued, which was shared almost exclusively with the fantastic American trio 31 Knots. After signing with the Berlin-based label Exile On Mainstream Records (distributed by Southern), the album had it's second life: wider distribution, promotion and touring (notably in Germany) including the very special, and sometimes chaotic, Blisstrain in the Spring of 2007.